Accounting for Nonprofits: Are Donor Advised Funds Right for Your Nonprofit? When it comes to accounting for nonprofits, keeping up to date with all the changes, advances, and newcomers to the field of finance and accounting can be challenging. We spotted this information about donor advised funds and wondered how many of our nonprofit colleagues were aware of this opportunity for charitable giving. Today we’ll take a look at donor advised funds and what they might mean to your nonprofit organization. According to GuideStar, donor advised funds managed $85 billion in assets by 2016. Here’s how donor advised funds work, the pros and cons, and next steps if you would like to investigate them further. A donor advised fund is a mutual fund created for the purpose of donating assets to a 501c3 organization. Donors with considerable assets may give to a donor advised fund instead of establishing a foundation or philanthropic charity to ensure their money is allocated to specific nonprofits. Donor advised funds are often maintained and managed by well-known fund companies such as Schwab, T. Rowe Price, and other financial companies. For example, T. Rowe Price created their Program for Charitable Giving in 2000 to enable individuals to give through the vehicle of an established fund. Donor-advised funds are managed by sponsoring organizations. The organizations must be 501(c)(3) tax-exempt organizations. Sponsoring organizations generally fall into three categories: community foundations, single-issue organizations, or national organizations, such as the previously mentioned T. Rowe Price Program for Charitable Giving. Companies like Price often create national organizations, Vanguard, and Schwab to give their customer base an effective way to manage giving programs. Individual or corporate donors contribute to a donor advised fund. They may take an immediate tax deduction. Assets now belong exclusively to the DAF. Often (but not always) the original donor is now listed as an ‘advisor’ to the DAF. The donating “advisor” can now recommend how the DAF assets are used and invested. The fund proceeds grow tax-free. The DAF advisor (the original donor) may request that donations be given to charitable organizations. The DAF fund management team conducts due diligence and, if the organization the DAF advisor wishes to give money to is a legitimate and eligible to receive tax-free donations, grants are issued to the charities. Thus, donors may use a DAF to pass money tax-free to a nonprofit entity. The DAF acts as an intermediary between donors and charitable organizations. This is similar, but not identical, to how private foundations act. In the case of the DAF, many individuals may contribute to the DAF, instead of one person establishing a private foundation to pass grants along to their favorite charity. There are numerous pros and some cons to utilizing DAFs for charitable contributions. Donors can take an immediate tax deduction regardless of when the money is actually given to the charitable organization. By placing money into the DAF, donors receive immediate tax benefits. Large financial firms managing DAFs are experienced at handling non-cash assets such as donations of stock, reducing headaches for accounting for nonprofits on how to categorize and value such donations. Ease of donating non-cash assets enables people to give more generously than they might otherwise. An experienced financial manager also handles daily money management decisions for the fund. Nonprofits may wait a considerable amount of time before receiving the aforementioned donation. There is no payout deadline. It can be difficult for investors to ascertain management or transaction fees. Some donors treat these funds as places to stash cash; they have no intention of giving more. For nonprofits interested in participating as recipients in donor advised funds, it’s important to take a few steps to establish your credibility and appeal as a recipient of their largesse. In general, you can solicit gifts directly from DAFs. Be sure to set up a profile on GuideStar or another charity watchdog site and be thorough and transparent with your nonprofit financials. Familiarize yourself with IRS rules regarding DAFs, and enact training to ensure everyone in your organization knows about DAFSs and can process gifts efficiently. DAFs aren’t for everyone, but they do provide nonprofit organizations with another powerful way to solicit funds and help donors view their organization as a potential recipient of gifts. 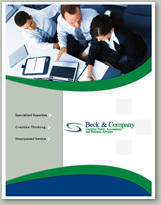 Beck & Company is an independent certified accounting firm specializing in nonprofit organizations. Since 1987, we have helped many nonprofits in the Washington D.C. area and along the Eastern seaboard with their accounting and financial management needs. We provide audit, tax, accounting, and consulting service that addresses all aspects of a small to mid-sized nonprofit organization’s business. Contact us or call 703-834-0776 x8001. Previous Previous post: Nonprofit Financial Management Topics: Is the Overhead Ratio Model Obsolete?